Kettenfragen is a game in which players must ask and answer questions correctly, in German. The players must quickly find the answer to the question posed and in turn read out a new question, creating an entertaining chain of questions. There are two different sets of cards to play with - each is a separate level of difficulty. 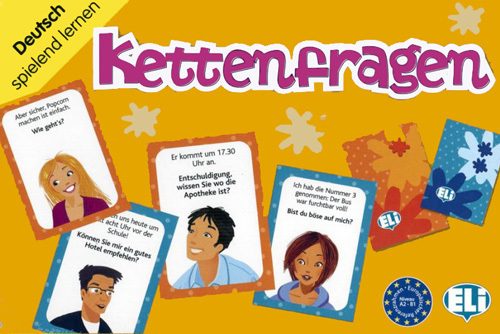 Kettenfragen is suitable for intermediates and above and is recommended for use by students from KS3 (age 11+) upwards, although it would also be suitable for use by more advanced upper KS2 students (age 9+). Please note that the game instructions are written entirely in German.